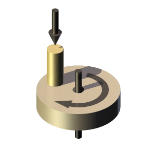 The Low Load High Temperature Pin on Disc Machine is suited to the friction and wear testing of materials under low loads in pin or ball on disc contacts and dry conditions. The machine can perform tests according to ASTM G 99 and DIN 50 324 and provides a Class 1 contact configuration (pin or ball loaded vertically downwards onto a horizontally rotating disc). The unit comprises the loading and friction force measurement system mounted on a base plate, with a variable speed motor and reduction gear-box, test spindle and disc carrier. Load and disc track diameter are set manually. The machine is bench-top mounted. 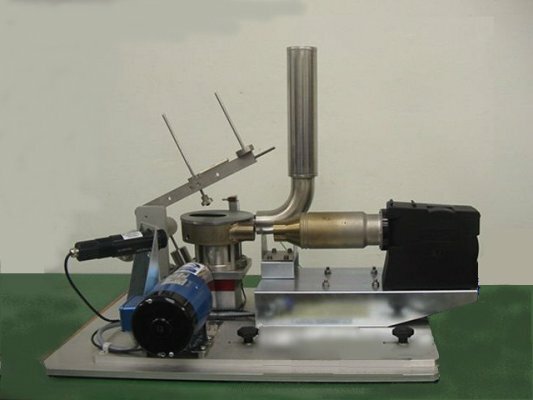 Specimen heating is by means of a PID controlled hot air blast electric heat allowing test temperatures up to 500°C with an optical pyrometer for temperature sensing. The control and data acquisition hardware incorporates a SUPERSLIM serial interface and COMPEND 2000 control and data acquisition software.